It’s lunch time in Svay Pak village, an urban settlement in the capital Phnom Penh, and 22-month year-old Heig Cethra helps himself to a plate of Num Kanhchay (rice flour mixed with green vegetables) while watched proudly by village health volunteer, Yei Sokly and his mother Pich Sivoeun. “He’s growing so big and he’s now even feeding himself” said Cethra’s 33 year-old mother, Pich Sivoeun. “He’s healthy because I received good advice from Sokly early on in this pregnancy”. 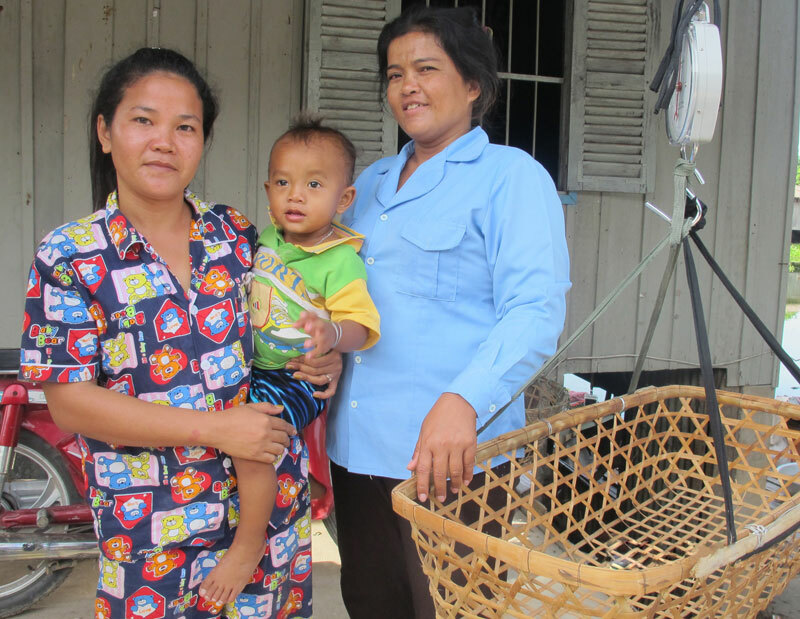 In 2008, Sivoeun’s first child who was two years- old, died from measles. “She died because I didn’t know how to take care of her and prevent the disease,” Sivoeun recalls sadly. “However, when I was pregnant with Cethra, Sokly was with me every step of the way. She encouraged me to visit the health centre for ante-natal sessions and get a tetanus injection to prevent maternal tetanus. She educated me on the importance of hand washing with soap, drinking clean water and eating more healthy food including, meat and vegetables. She advised me to take de-worming, vitamin A and iron tablets. After the pregnancy, she ensured I followed up with all the vaccinations for Cethra and that I breastfed him for the first six months. Her role is important because she educates many women in the village on health issues and encourages them to visit the health centre,” Sivoeun added. 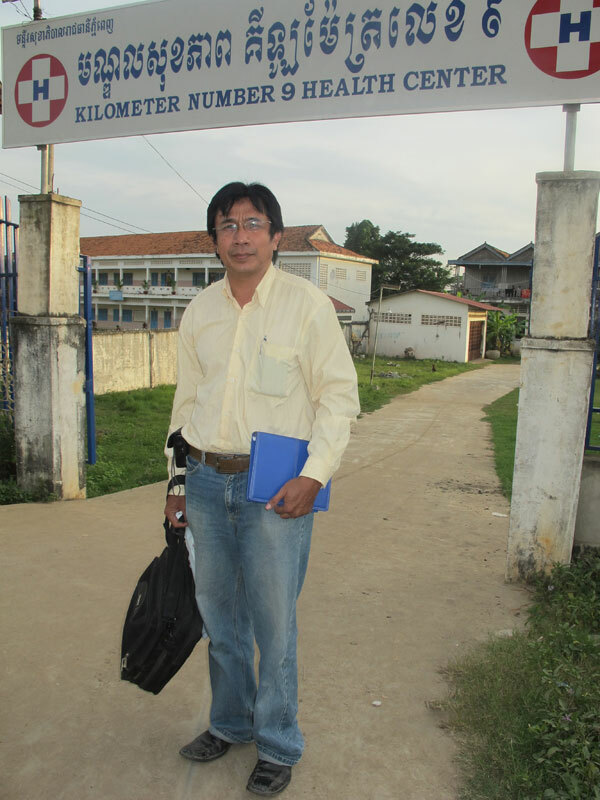 Sivoeun is referring to Svay Pak’s village health volunteer, Yei Sokly who is one of two trained health support volunteers who work to address the health needs of the poorest people, in urban settlements in Phnom Penh. Sokly received seven days training from the municipality operational health district with funding from UNICEF, and the Nordic Committees for UNICEF. The vital funding provides technical and financial support for the training of village health volunteers who are elected by their communities, to provide basic health education to prevent childhood illnesses, identify danger signs in children and women, and support timely referrals to health facilities. “Before becoming a village health volunteer, I was a housewife and I wasn’t aware of health issues including child and maternal health,” said Sokly. “I used to hear a lot about the village health support group from my neighbours, village chief and health centre staff, and I then decided to train as a volunteer. After receiving the training from UNICEF, I’ve been able to educate so many people about accessing health services and the importance of good health and hygiene practices. Seeing the positive behavioural changes occur in regard to healthcare practices, even among the ethnic communities, makes my job so satisfying. I just thoroughly enjoy being able to help others,” she adds enthusiastically. 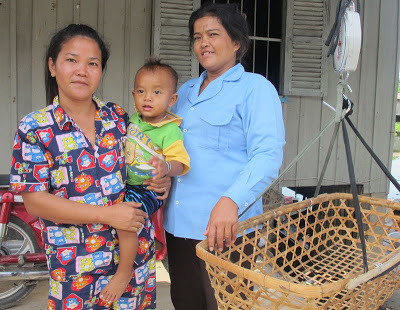 Sokly, who is a mother of three, has been a village health volunteer for seven years and conducts regular sessions twice a month at her home in Svay Pak village, for pregnant and postpartum women. During these sessions, Sokly registers the details of participants in her Community Care of Mothers and New-born Health book. For pregnant women, she records their ante- natal visits to the health centre and the amount of iron and mebendazole tablets they have received. With postpartum women, she weighs their babies using scales funded by UNICEF, and records their weight, date and location of delivery and the baby’s status. Using her counselling cards, Sokly educates the women on identifying danger signs before, during and after pregnancy. She provides advice on family planning, birth control, vaccinations and HIV and AIDS. She promotes exclusive breastfeeding, complementary feeding and informs them about micronutrients for severely malnourished children. When asked, what were the main concerns women who attended the sessions had, Sokly replied, “Most of the women are scared about visiting the health centre because of the costs associated, such as transportation and the hospital user fee. They worry how they will find the money to cover these costs, which sometimes can amount to US$21.00 in total,” she added with concern. In addition to providing general advice on maternal, new-born, ante-natal and post-natal care, Sokly also offers information on dengue fever, diarrhoea and respiratory infections such as pneumonia. In Cambodia, diarrhoea and pneumonia are among the leading causes of deaths among children under-five. In 2010, 7 per cent of child deaths in Cambodia were attributed to diarrhoea, and 28 per cent to pneumonia. However, over the last five years, illnesses related to diarrhoea have significantly reduced in Sway Pak village, which has a population of 5,059, and over the last two years, the village has witnessed no child mortalities. In the afternoons, Sokly carries out her outreach activities by visiting families at their homes. These visits are aimed to identify and follow up with women and children who did not receive the basic services at the health centre. “Visiting families at their home, enables me to identify and refer them to access health facilities urgently or if they are in need of vaccinations to prevent diseases” said Sokly. Her activities also include, distributing micronutrient powder for severely malnourished children aged six to 24 months, whose mothers missed the outreach sessions conducted by health centre staff; and counselling on ante-natal and post-natal care. Last year in June 2011, during the dengue outbreak, Sokly distributed tablets to be placed in water storage containers (common mosquito breeding sites), to 325 households in her village, and as a result, no dengue cases were reported that year. The distribution of the water tablets was deemed a success and now Sokly carries out this task twice a year, to reduce the risk of villagers contracting dengue.